Supply-side economics on the Danube. Hungary’s next general election isn’t until 2018, but you wouldn’t know it from the goodies that prime minister Viktor Orbán is giving away. His government previously hinted at sweeping tax cuts, but the details revealed today were much more aggressive than expected. Most notably, the country will cut its corporate tax rate to 9% next year. This flat rate will give Hungary the lowest rate in the EU—take that, Bulgaria!—as well as one of the lowest anywhere in the world. 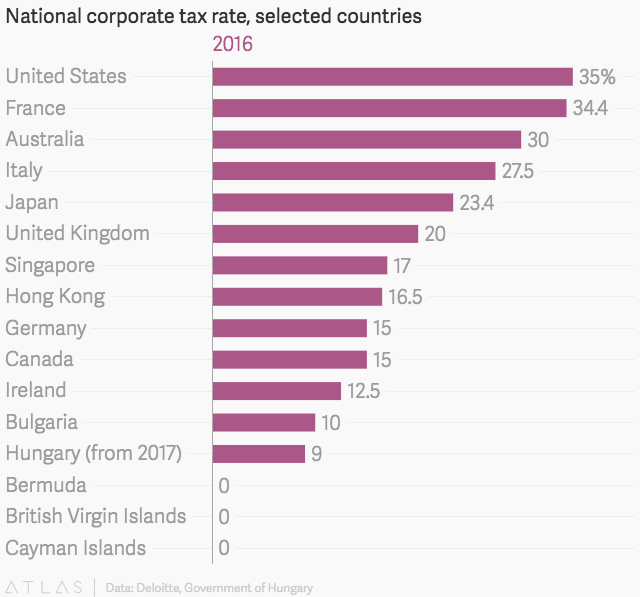 Currently, Hungary charges a 10% rate on small businesses—covering corporate income up to 500 million forints ($1.7 million)—and 19% on anything above that. In addition to Orbán’s big-business tax cut—not exactly an obvious move for an outspoken populist—the Hungarian leader has pledged to reduce personal income taxes, which are currently levied at a flat 15% rate, and sales taxes. He also wants to raise the minimum wage, funded by the savings from the corporate tax rate cut and a reduction in payroll taxes. Like elsewhere in eastern Europe, Hungary is grappling with an emigration problem—its population has shrunk by 5% since 1990, with workers seeking better opportunities outside the country. This has led to labor shortages and wage inflation; in the rankings of economic competitiveness, Hungary lags behind many of its neighbors. Orbán, now serving in his third term as leader, says he wants to build an “illiberal state,” and the unorthodox economic policies he has imposed while in power have kept markets guessing. “Orbanomics” has shunned austerity in favor of raising revenue via occasional “crisis” taxes on banks, telecoms, energy companies and other sectors that tend to feature foreign investors. He also controversially nationalized pension funds and is currently fighting the EU over internet and advertising taxes that disproportionately hit media companies. At the same time, Hungary’s debt was upgraded from “junk” status by all three major ratings agencies this year, who were encouraged by the country’s manageable deficit and steady—if unspectacular—economic growth. Today’s tax cut is “not out of line” with an expected loosening of the purse strings, “given the tendency in Hungary for pre-election spending,” says Evan Wohlmann of Moody’s. The world will be watching next year to see whether lower taxes trump populist-driven policy uncertainty for those wary of doing business in the country. That applies to Hungary as well as a bigger country where those words—populist, taxes, uncertainty, Trump—are also newly relevant.